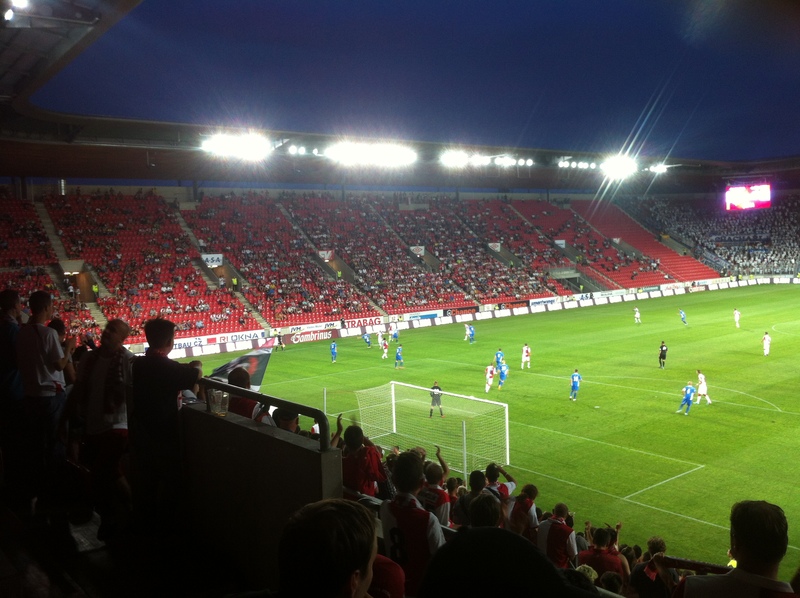 Slavia Praha kicked off their season with a frustrating 1-1 home draw against Banik Ostrava. Missed chances and defensive mistakes cost Slavia two points here, however, there were signs of encouragement with the amount of chances created in a second half rally. Over 7500 fans were dotted around Eden and the combination of the sweltering weather, David Hubáček saying his farewells and ‘Two for 50kc” Gambrinus had generated a party atmosphere. The opening day of the season tends to do this, but the players failed to respond and served up a turgid opening 45 minutes. The first half was difficult to watch. Two big names testing each other out but ultimately lacking any genuine quality, it reminded me of a Audley Harrison v Frank Bruno sparring session. Slavia, however, started the second half with better purpose and tried to play passing football rather than lump it forward but you could sense the ball was never quite under full control. Then on 59 minutes Davor Kukec scored from no where with a decent long range effort. But blame has to lie squarely at the feet of Čontofalský who, for some unknown reason, dived over the ball. An absolute howler. Čontofalský had a bad game in general, his distribution was poor and he failed to stop Banik’s only real effort on goal. His nervousness seemed to rub off on his defence who stood off Kukec as he approached the Slavia penalty area. With Karol Kisel struggling to make an impact on the game Slavia used their width and started to ping crosses into the box. Minutes later Tomáš Mičola scored a technically excellent volley from a lofted cross. The floodlight failure on 70 minutes was bizarre. Slavia fans were jeering and chanting “Zaplaťte inkaso! !” *Pay the Bill!! It would be quite funny if it wasn’t so near the truth. But once the lights came back on Slavia pressed in search of the winner and missed two gilt edged chances deep into injury time. With Milan Nitrianský the guilty party blasting his effort high, wide and handsome when it seemed easier to score. It was a point gained for Banik but two dropped for Slavia. Along with the result I was also disappointed that Viktor Šimeček wasn’t named in the Slavia squad (was he injured?). Viktor was named the player of the season in the Czech junior league last year and he seems more than ready for the first XI. Šimeček, Gecov and Kisel in the centre of midfield could be just what Slavia need. Up next is a tough away match to Liberec who have a head start in terms of match fitness – a game I would be more than happy to take a 1-1 draw from.